I watched Reservoir Dogs again two days ago and to this day, it is still one of the most stylish & amazing films of all time for me. This film has it all. It has immense style, it has cleverly planned violence and it has a wonderful script. Background isn’t given on most of the characters, and that’s the point. The anonymity of the characters (hence the code names) is important to the movie’s plot. These people are mostly all strangers to each other. We know as much as they know, for the most part. Part of Tarantino’s genius is his ability to give you only what you need, and nothing extra. The dialogue is extremely well written, it contains lots of humor, especially sarcasm that is very hard to achieve. The opening scene and the debate about the aliases are priceless. The acting is flawless. Buscemi, Madsen, Roth and Keitel are all equally outstanding. Tierny and Penn team up perfectly. The smaller parts played by Tarantino, Jackson and Bunker are all very colorful. The direction may not be anything special, but even though there are a few incoherences, it’s rather solid. The (in) famous ear-cutting scene has some smart direction as the camera moves away from the mutilation and shows us a door with “WATCH YOUR HEAD” written over it. Many interesting themes are brought up throughout the film. Loyalty and reliability seem to be the main one, Mr. Blonde stuck up for Joe, Mr. Orange tells Mr. White the truth, all the robbers go to the meeting place despite the fiasco. Although this film contains a diverse range of techniques, I would have to say that the most original aspects of the film were: The camera angles and the music. 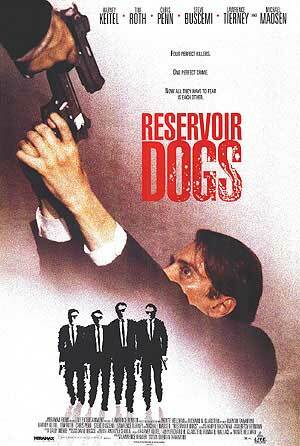 Despite the plot being superb, every word out of the character’s mouths interesting and unusual, the casting brilliant, and the acting gripping and totally realistic, it is the camera angles and the music which really give Reservoir Dogs its atmosphere, which in this movie is everything. The shots in this film add much to the suspense and are at times uniquely directed. Many times throughout the movie the shot is so far away that it is impossible to ascertain which character is actually speaking and therefore it almost seems that the characters play a secondary role to their dark and miserable surroundings. Although the camerawork effectively creates the mood, it is the music, which truly plays the most vital role in Reservoir Dogs. Everyone is stylish in Tarantino’s world and this is reflected through the use of music. The recurring theme of the radio show `K-Billy’s Super Sounds of the Seventies Weekend’ plays an extremely important role in the music element of this movie. Nearly all the music present in the film is actually heard from radios in cars or bars and is always K-Billy’s Super Sounds of the Seventies Weekend. The gangsters talk about their identification with the Radio show, and have a kind of shared memory with each other through the songs. As for all Tarantino movies, the soundtrack is excellent. In Reservoir Dogs it has something more than in Tarantino’s other films as the heist takes place at the same time as a special retro 70’s music radio show. Tunes from the 70’s are scattered all over the story as characters turn the radio on and off. I think that that was a very good idea and a nice little touch. All the more because the songs are often used to illustrate what’s happening on the screen. As Mr. Blonde tortures Nash, ‘Stuck in the Middle with you’ highlights the two cops’ situation who are stuck in the warehouse with a few panicked criminals. The last song ‘Coconut’ brings us back to reality, if you listen to the lyrics, it’s just a silly song about a guy who wants to get rid of his bellyache. This is very ironic, as one of the characters has just spent the last 90 minutes with a bullet in his gut. Tarantino is basically saying that this was just a film, not real life. Although Pulp Fiction is probably the better of the two, Reservoir Dogs is my favorite Tarantino film. I’m not too sure why, I think the experimental side tips it for me. Having the whole story happen in the warehouse with just a few flashbacks to tell us everything was clever and hard to pull off, but here it’s done with panache. Coming back to Tarantino who also wrote the script, he has cleanly and charismatically shown the precision of gangster dialogue. This movie is an in your face version of psychopathic violence, killing and bad language. But please! Don’t take it in the literal sense…these are just backdrops. Focus more on the long takes, like Michael Madsen (Mr. Blonde) going out of a warehouse to grab a can of petrol from the car and then going back and splashing it on a cop. The careful viewer will notice lapses in direction, such as the orangeness / redness of hours old blood, instead of the reddish brown that it becomes. Occasionally, the scenes seem a little loose, but all the ingredients of a good film are there. The acting is not bad at all, and one shall not be disappointed there. But I have to give special notice to the chilling Michael Madsen. For those who have only seen him in “Free Willy” or “Thelma and Louise”, be prepared to be terrified and blown away. Madsen is better than perfect as the showstopper Mr. Blonde. His look, his acting, everything about his performance is flawless and I have to admit, that Madsen’s Mr. Blonde was my favorite character in the piece. He has unforgettable lines “Are you Gonna Bark all day, Little Doggy, or are you Gonna Bite?” And he has the best and most chilling scene in the movie, the “Ear Torture Sequence”. Wait until you see him dance to “Stuck in the Middle with You.” you will be revolted and want to turn away, but you won’t be able to. Cool and terrifying, Madsen’s performance, at least in my opinion, is the best in the film. Because even though he’s terrifying, the audience has to admit that he’s cool. This movie is extremely violent, gory and filled with expletives. Reservoir Dogs, like many Tarantino flicks, is not organized chronologically, and can sometimes confuse the viewers as to what is going on. You have to keep your eyes wide open at all times to put the pieces of the puzzle together. It is not only Tarantino’s best, but also one of the masterpieces of Hollywood. Watch this film once and you will enjoy it, watch this film more than once and you will see things you didn’t see before.